That would not be the last time we would be reminded that, at Yotel, things work a little differently. The unusual names are only one of the features that separate Yotel from your typical hotel. Though we wouldn’t go so far as to declare it “the world’s most radical hotel,” as their marketing materials claims. Yotel guests don’t sleep in bizarely decorated rooms or dine with giraffe or dress up in hamster suits. And that’s the good thing. The Yotel New York isn’t weird for weird’s sake. There’s a fun, hip spirit to the place to be sure. But the experience is created with functionality very much in mind too. That experience starts when you first step off of Tenth Avenue, three long blocks from Times Square, and into the Yotel New York. This is Ground Control (where the staff pay homage to David Bowie with shirts identifying themselves as “Major Tom”). You won’t see a check-in desk here. Instead, there are kiosks of the sort you’d find in the airport. 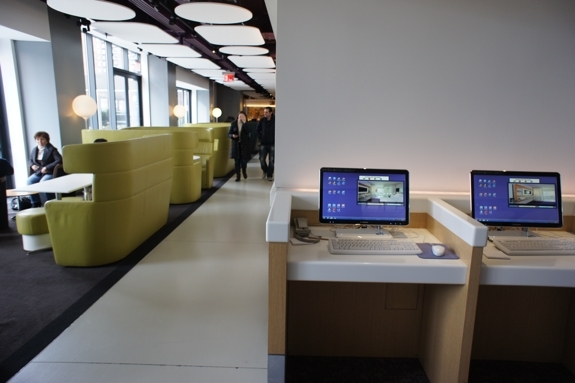 The user interface is simple, designed to keep the check-in process to less than two minutes. (Ours took about half that). 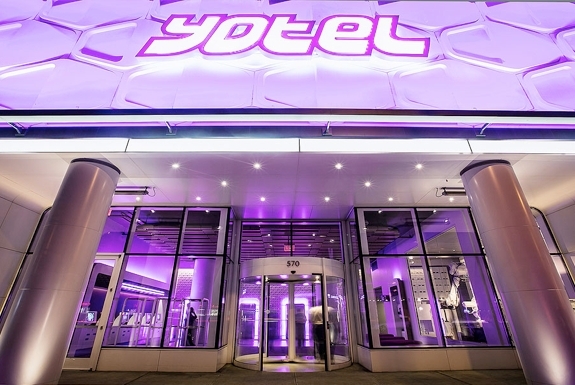 If you’ve arrived early and your room isn’t ready yet, Yotel will store your bag for you. Or, rather, Yotel’s robot will store your bag for you. Place your bag inside a receptacle and the giant arm of the Yobot will pick it up and place it in a sort of storage locker. The service is free for hotel guests. So, even if you don’t need your bag stored while staying at the Yotel, it is hard to pass up the chance to give the Yobot a try. 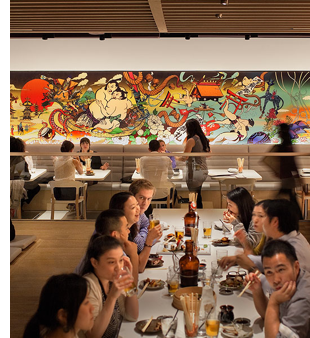 • DohYO Restaurant & Bar — A colorfully decorated Latin-Asian fusion restaurant that features long communal tables. This is also where guests gather for the complimentary breakfasts. • Mission Control — A cross between a lobby area, front desk, concierge desk and gift shop. Any help you need, either with your Yotel stay or with travel in New York City in general, this is where you find it. • The Club Lounge Bar — Guests gather by the cool, if small, bar for drinks. But we also like the tables adjacent to the bar where you can plop yourself down at a table with a laptop or book. • The Terrace — An outdoor gathering and drinking spot that’s lovely on warm evenings. There are many boutique hotels with lobby and ground floor areas that are hip and stylish while their rooms are very ordinary. 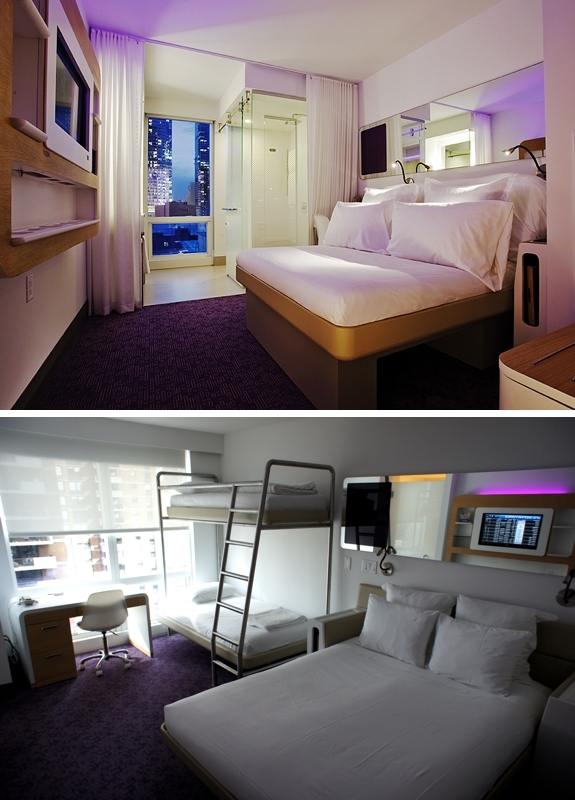 At the Yotel New York, their cool aesthetic very much extends to their rooms cabins. You’ll notice the clean, modern design immediately upon opening your room door. You’ll immediately notice something else too: The accommodations are tiny. The Premium Queen Cabins — the room category that comprises the large majority of the Yotel New York’s inventory — is only 170 square feet (16 sq m). That’s so small that your bed, when you first get to your room, will be an over-sized couch. You have to push a button to have it electronically fold down into a full flat queen bed. But what the Yotel’s Premium Queen Cabins lack in size they make up for in smart design. There’s seemingly a space for everything — shelves, drawers and hanging spaces. There’s a flat screen TV with an iPod dock that lets you play your music through the cabin’s speakers. There’s a work desk with easily accessible plugs. There’s a rain shower and a sink with large mirror. And there are lots of little touches, like a tray for in-bed snacking and heated towel racks and two kinds of shampoo & body wash: “Get Up” (an invigorating blend of sage, eucalyptus and echinacea) and “Get Down” (a calming blend of lavender, rosemary and arnica flower extract). Though some guests will certainly bemoan the lack of space, Spot Cool Stuff is not among them. Yotel’s Premium Queen Cabins are perfectly comfortable — in fact, luxurious in some ways — and, anyway, when we are in NYC most of our time is spent out and about, not in our hotel room. We do a have a mild preference for a more substantial mattress; because the bed is made to fold it isn’t as thick as what you’d find in other hotels. If you are among those who want more spacious digs, check out Yotel’s First Cabins. They’re 320 square feet (30 sq m) and come with a traditional king-sized bed. Some First Cabins even feature their own private outdoor hot tub and terrace! Yotel also has cabins with one or two bunk beds that are family friendly. And for larger groups, or occasions when money is no object, there are very cool VIP Suites. The Yotel New York is not the sort of place that nickle-and-dimes their guests. Among the hotel’s complimentary offerings include fast (really fast!) wifi internet, use of the hotel gym (a very small gym, but a gym nevertheless) and a breakfast of tea, coffee and muffins. 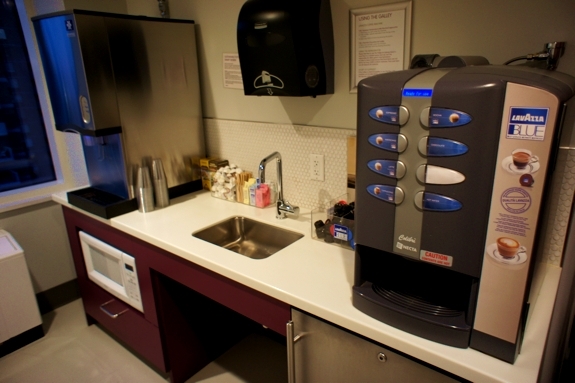 Every floor also has a communal “galley” with a refrigerator, microwave and hot drink machine. (Photo below). 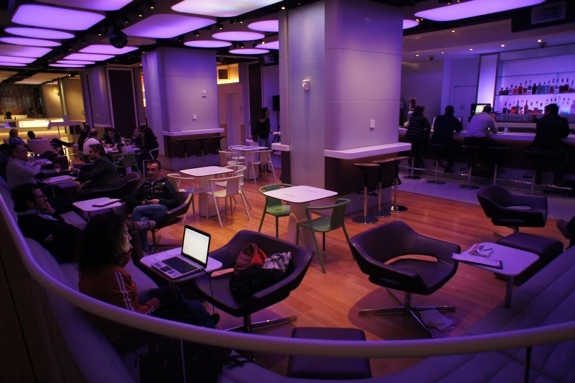 The Yotel New York runs regular other free offerings for their guests too. 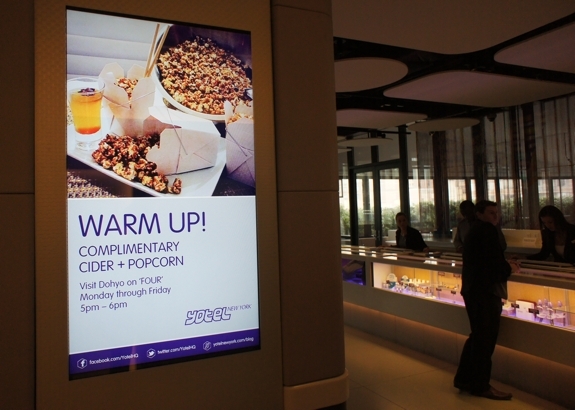 While we were there, Yotel was hosting a free cider and popcorn social gathering. In the past they’ve even provided their guests with free bicycle rentals! Yotel New York is chock full of cool touches, big and small, that make for a fun, comfortable — and memorable — place to stay. Though the accommodations at the Yotel New York are distinctive, the room rates are not. At the time of writing, a weekday night in a Premium Queen Cabin at the Yotel NYC was going for $125 (excluding tax). That’s about what the drab 2-star Econo Lodge Times Square was charging for the same night, and about $50 less than the generic 2.5-star Comfort Inn Times Square South. Quite a good value! 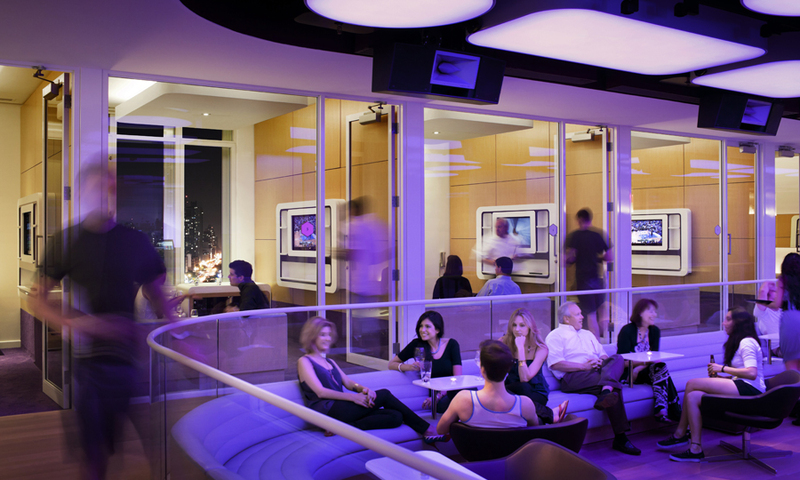 Even more than the reasonable price (especially by NYC standards), what we love most about the Yotel is the atmosphere. New York City has lots of nice hotels where solo travelers can be comfortable but never talk to another guest. And there are several hostels that pair active communal areas with no-frills accommodations. But few hotels have both the social vibe and the luxury-tinged accommodations like the Yotel does. This isn’t to say that the Yotel is for everyone. Some travelers might prefer more sedate, less social digs. And there’s certainly better locations to stay in New York City than next to the bus station three blocks east of Times Square. Still, Spot Cool Stuff is a huge fan of the Yotel New York. Most of our readers, we suspect, will be too.  Yotel currently has airport properties at London Heathrow in Terminal 4, at London Gatwick in the South Terminal and at Amsterdam Schiphol on the 2nd floor near passport control.